I have read more than 10 books on presentations so far and do not wish to read any more in the near future. It is better to implement what one has learnt than keep reading new stuff. Having said that, I got hold of this book for free. Could not resist buying it (I mean it was free!). I did read the book. 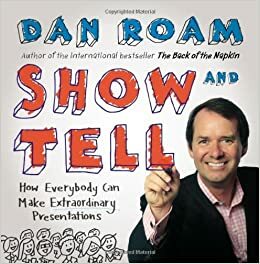 I have read Dan Roam before. The book is quite simple, nice and very fast to read. How can you make extraordinary presentations? We deliver a report, a pitch or a presentation so that the audience sees the things the way we do. A normal presenter shares data. A good presenter changes what you know. A great presenter changes what you believe. If we follow these three rules, we will achieve our objective. How? When we tell the truth - we connect with our audience, we become passionate and we find tremendous self confidence. Our fear comes down. We remember what to say and we are more convincing. When we tell it with a story - we are able to make complex things simple, we make our ideas memorable and we appeal to everyone. We are understood by everyone and they remember what we said (stories have high recall). When we tell our story with pictures - we communicate clearly and there is no confusion. We captivate our audience and we remove boredom. To figure out how you will implement these, do read the book.